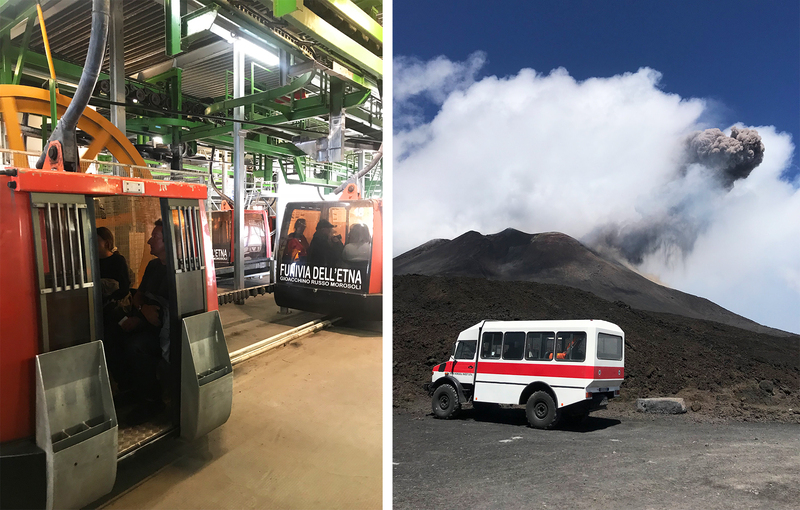 One thing I definitely wanted to do when planning my trip to Sicily was visit Mount Etna. Located on the western side of the island about 20 miles north of Catania, it’s the largest active volcano in Europe and one of the most active in the world among the ranks of others including Kīlauea in Hawaii, Mount Mayon in the Philippines and Grímsvötn in Iceland. 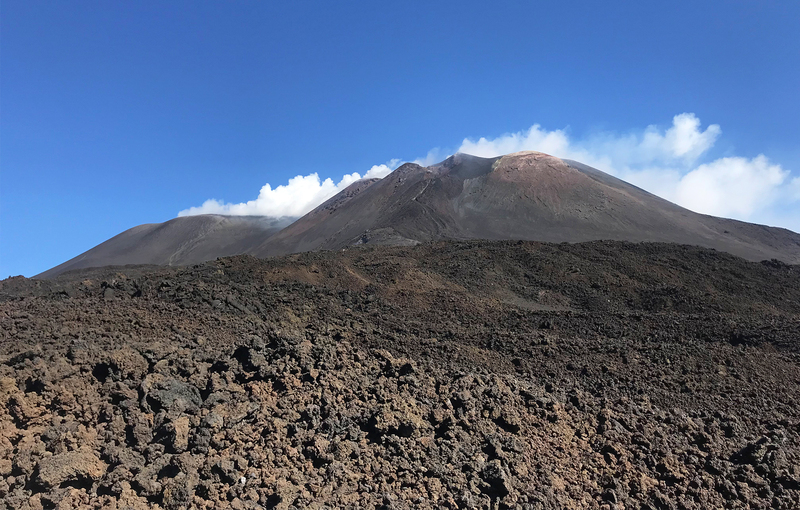 What makes Etna especially interesting is that it’s been in an almost constant state of activity for almost 600,000 years. Most notably, in 1669 a catastrophic eruption that lasted 3 months engulfed Catania and 11 other towns, forever leaving its mark on the region. 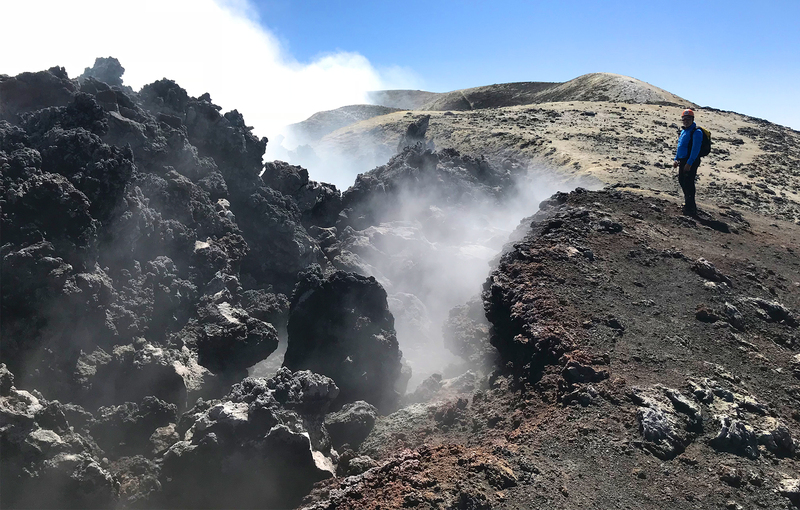 More recently, the nearly 230-square mile area surrounding Mount Etna became a protected park in 1987 and it was named a UNESCO World Heritage Site in 2013. I knew I wanted to book a guided tour but was overwhelmed by the number of options and varying pricing online. I found a detailed map of Mount Etna and literally had to make a spreadsheet to compare what each individual company and tour would cover. 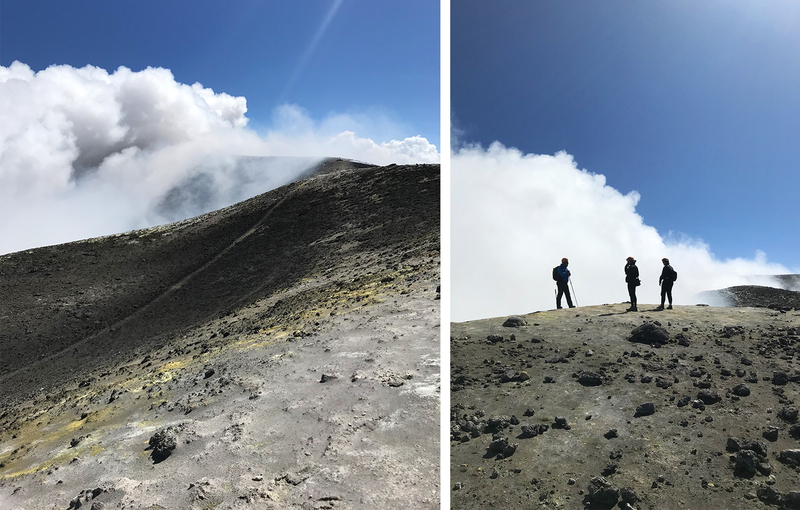 Going to the summit was definitely on our wish list because, how often does one have the opportunity to climb to the top of a volcano (when in Sicily, right)? 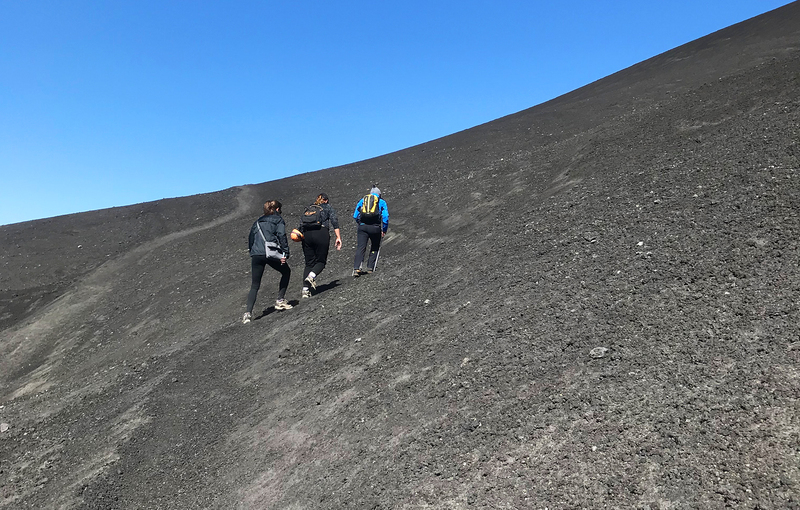 We decided to book the Etna Summit Hike with Etna3340, which would allow us to visit several different areas on and around Mount Etna with a fair amount of trekking. On the day of our tour we were picked up at our hotel in Catania promptly at 7:15 a.m. with a quick stop for coffee before our small group of 3 were fitted with hiking boots and introduced to our guide/volcanologist Marco. 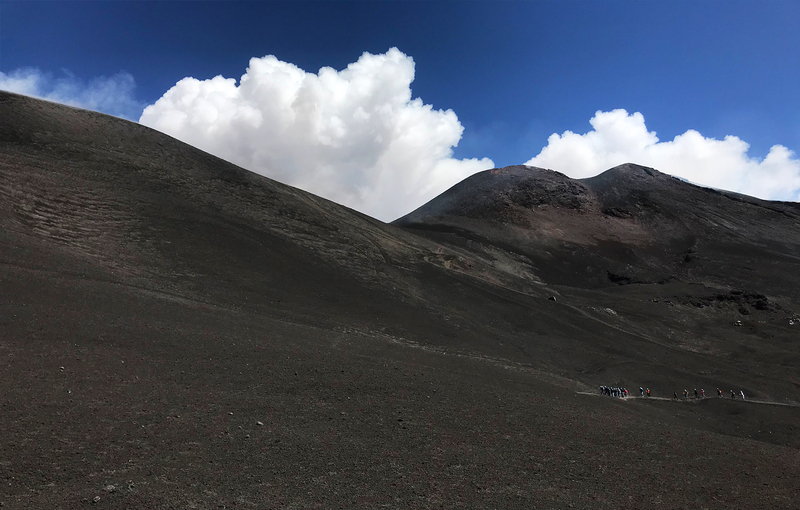 As we dove up the windy road to the Rifugio Sapienza cable car station on the south side of Mount Etna, Marco gave us an overview of what our day would entail, along with the history of Etna and mini science lesson as to what makes this volcano different from others. At the station we had the opportunity to grab sandwiches for lunch before boarding the cable car that would take us from 1910 meters to 2500 meters. From here we boarded a 4×4 bus through a lunar like landscape of black lava rocks to Torre del Filosofo at 2920 meters. This is the highest point that visitors are able to go without a guide, which is where you’ll find some pretty spectacular views and extinct craters to explore. Although, we were there to see more and so our trek to the summit began. Marco explained that the rocks we were walking on were only about a year old from an eruption that took place in the spring of 2017. 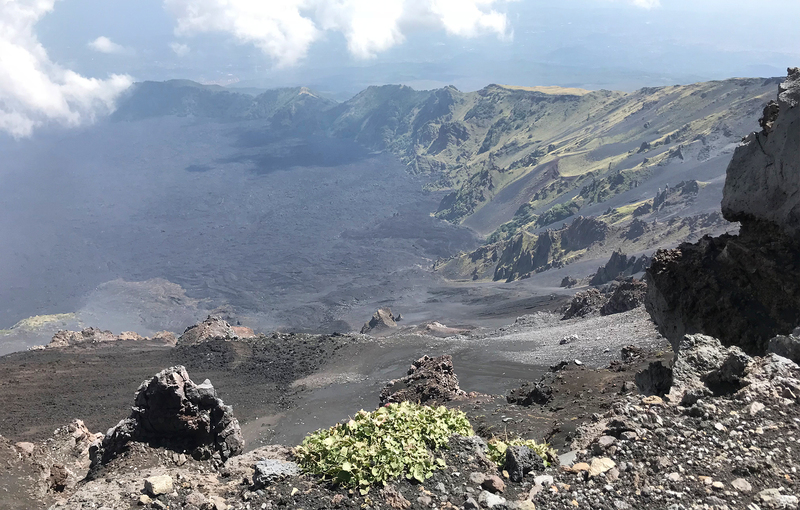 In fact, Etna is always changing, which is why I assume he never gets tired of leading tours after nearly 20 years as a guide and climbing the mountain since he was 3 years old with his father who was also a guide. As our uphill hike continued, the temperature became noticeably colder. 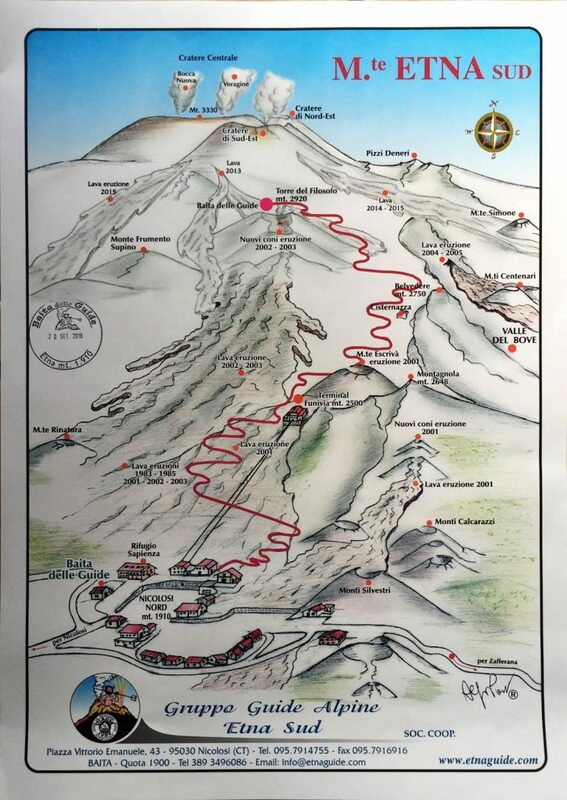 Believe it or not, Mount Etna gets a decent amount of snow in the winter, making the area a prime ski destination in Sicily. Even in early September we were instructed to bring layers (including a wind-resistant jacket, gloves, etc. ), which we donned as we climbed higher, along with a helmet in case any loose rocks were to get picked up by the wind. After about an hour or so we arrived at the rim of the main crater, Bocca Nuova. 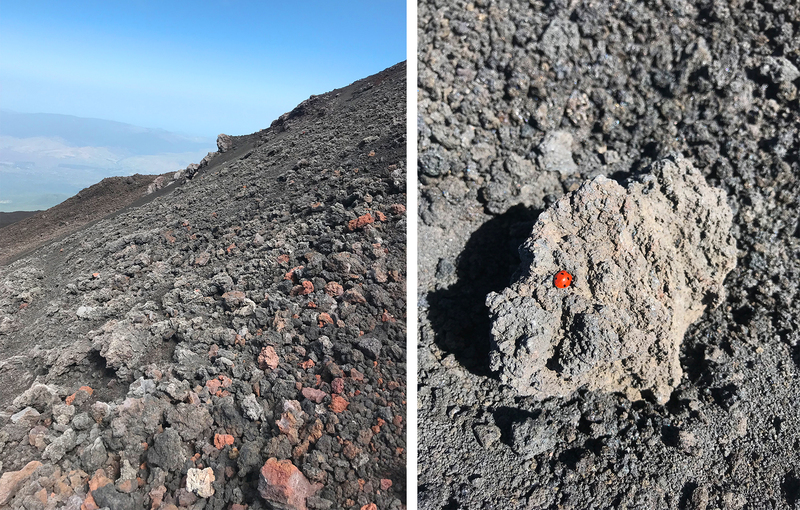 Mount Etna actually has 4 active craters but only 3 cones – Bocca Nuova and Voragine, Northeast and Southeast, the latter being the most active. Here at 3330 meters, steam clouds billowed from the 400-meter wide hole, creating a sort of post-apocalyptic scene around us. It was a surreal experience to say the least, one that no words or photos could do justice to. After spending some time at the top, it was time to start making our way down. Marco showed us how to dig our heels into the loose lightweight lava stones and sort of glide down the side of the hill as if we were skiing on fresh powder. When we reached the bottom of the valley we stopped for a lunch break, watching other groups in the distance – some with as many as 40 people – make their way to the top of the volcano. Getting an early start had its advantages as we were actually the first group to hike up to the summit that day. Thereafter we visited several other areas around Etna including the ancient Valle del Bove and the site of the 2002 eruption near the area where the 4×4 vehicles dropped us off earlier in the day. 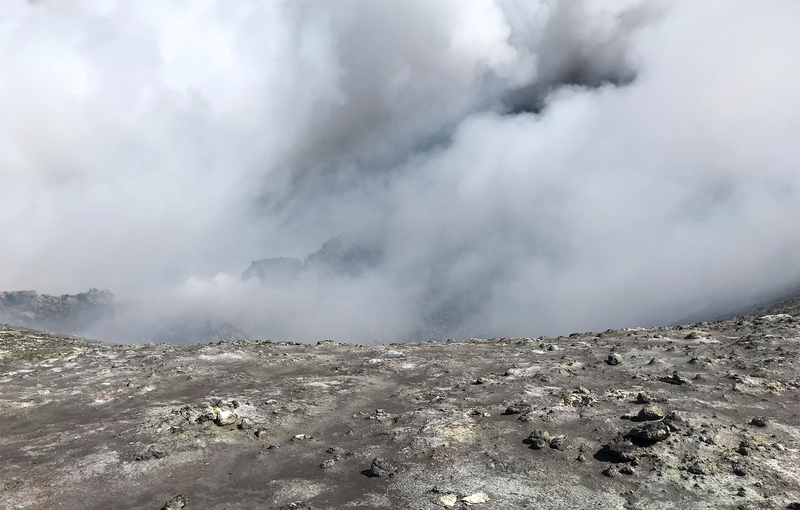 As we stood on the edge of the extinct crater, we heard an explosion behind us and quickly turned to see smoke and rock debris flying in the air from the Southeast crater. There were a few other small eruptions from the same crater that day that we also witnessed as we made our descent (see the photo with the bus above). 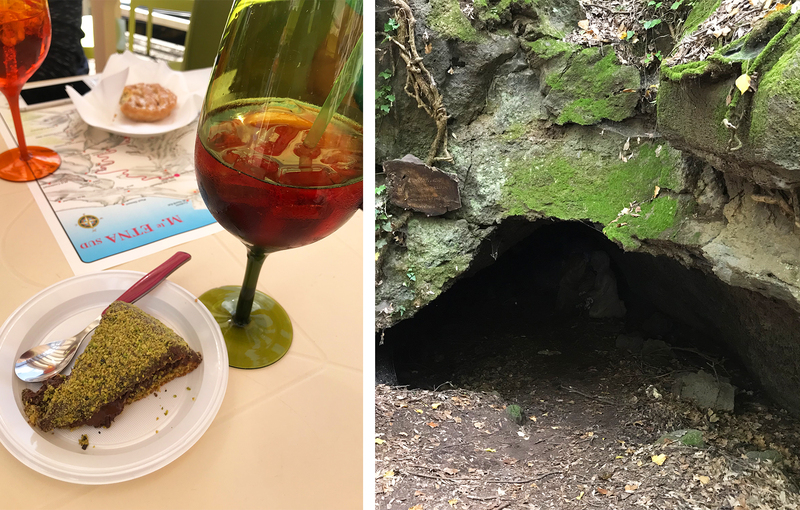 We took the cable car back down to Rifugio Sapienza and stopped for another coffee break (or aperitivo and cake, in our case) before driving a short ways to explore the inside of an old lava tube. We were dropped back at our hotel around 5 p.m., marking the end of a long but fascinating day. Marco was the perfect guide – super knowledgeable and laid back, creating an enjoyable and memorable experience for our small group. We definitely saw more than we expected and I would highly recommend this tour to anyone visiting Sicily.